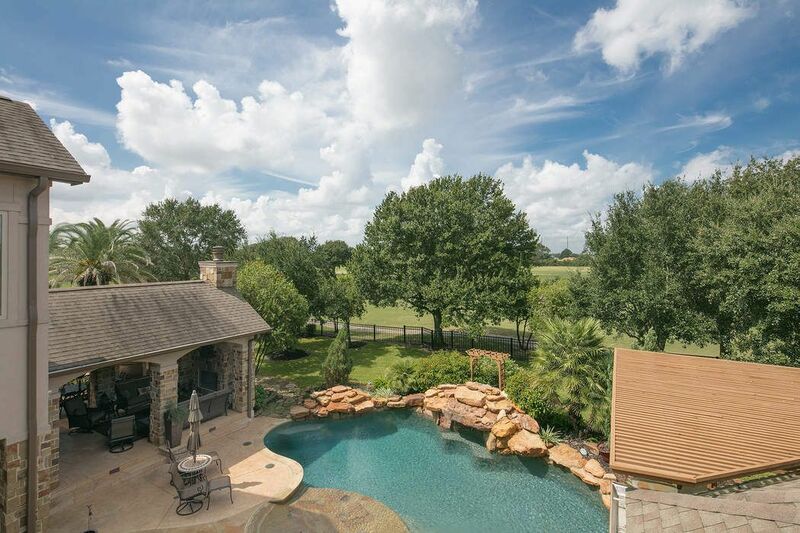 12407 Broken Pine Lane, Cypress, TX 77433 | Martha Turner Sotheby's International Realty, Inc.
Resort-inspired loggia, summer kitchen, stone fireplace with separate outdoor dining & seating. Flagstone terraces, grotto, heated pool & spa. Enjoy your own private retreat with every desired amenity executed in the highest quality and taste. This loggia could be on the cover of any architectural magazine! Living at its finest. 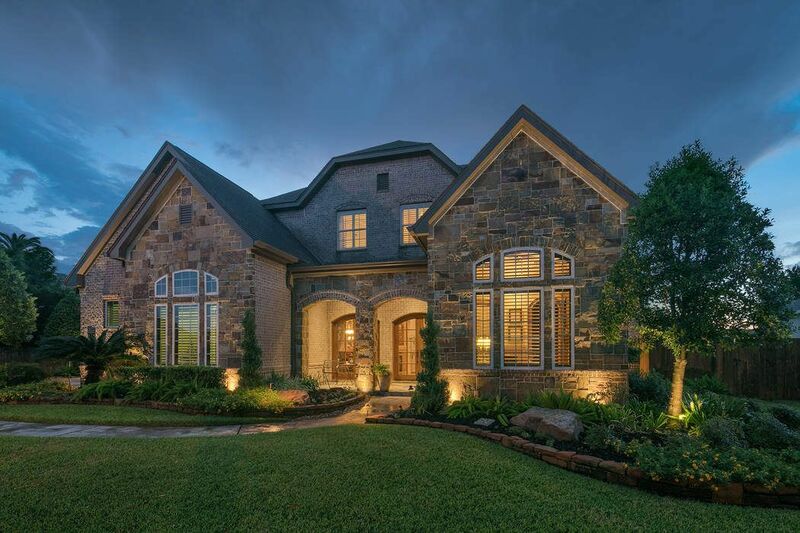 Beautiful architectural detail, wood burning fireplace, spacious outdoor living, spacious outdoor dining, outdoor grill and gas cooktop. View of pool and BlackHorse golf course beyond taken from upstairs bedroom from private balcony. 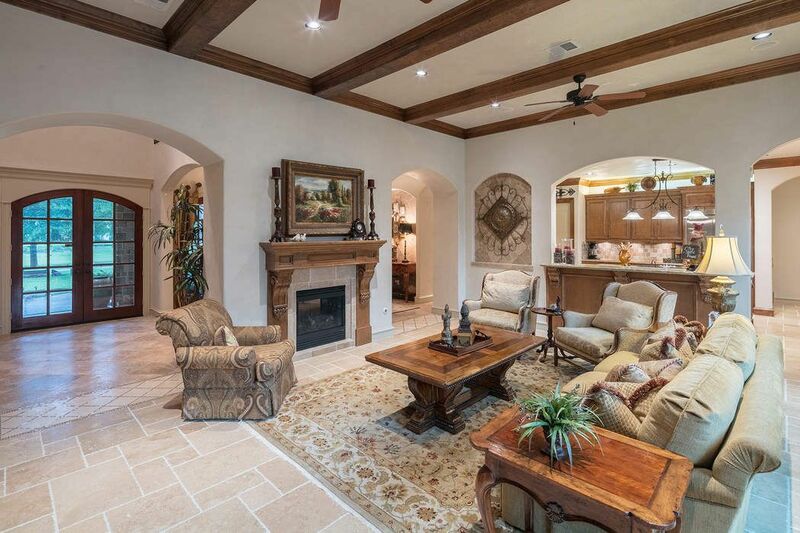 Located in the prestigious gated community of BlackHorse Ranch, this home sits beautifully on the golf course on about a 1/2 acre. 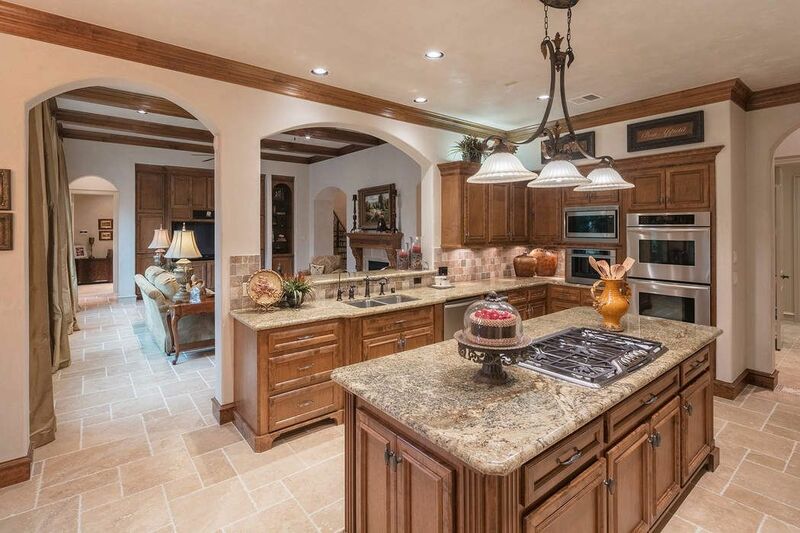 All homes in this estate section are on large lots providing a feeling of grandeur and spaciousness. 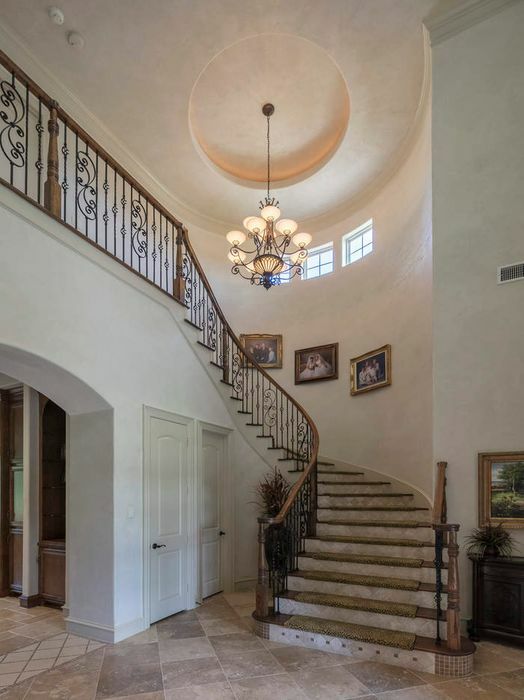 Grand, gently-winding staircase with wrought iron balustrade and domed ceiling with recessed accent lighting. Diamond plaster walls provide exceptional standard of quality. Note the wood and tile stairs with carpet inlay. 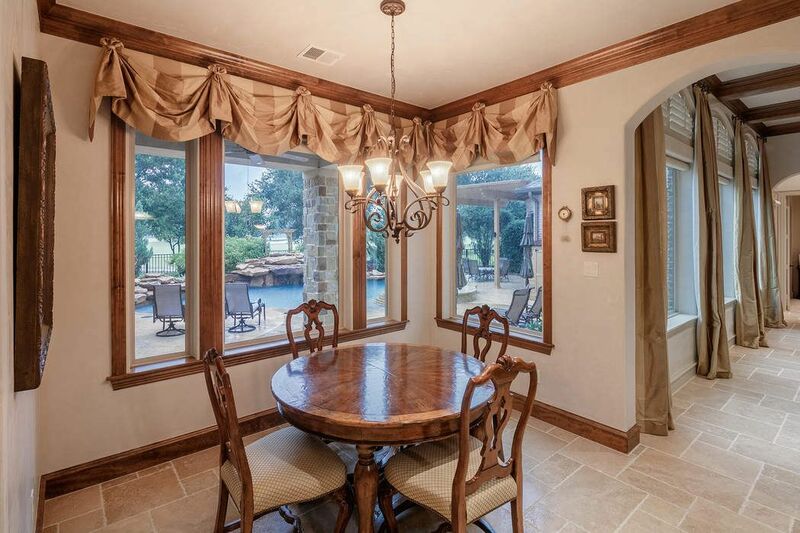 From the family room, simply stunning views of the pool, back yard retreat & golf course beyond. Note the custom crafted entertainment cabinet. This light filled room has 2 sets of electronic shades with remotes, 1 for sunshade & 1 for privacy. 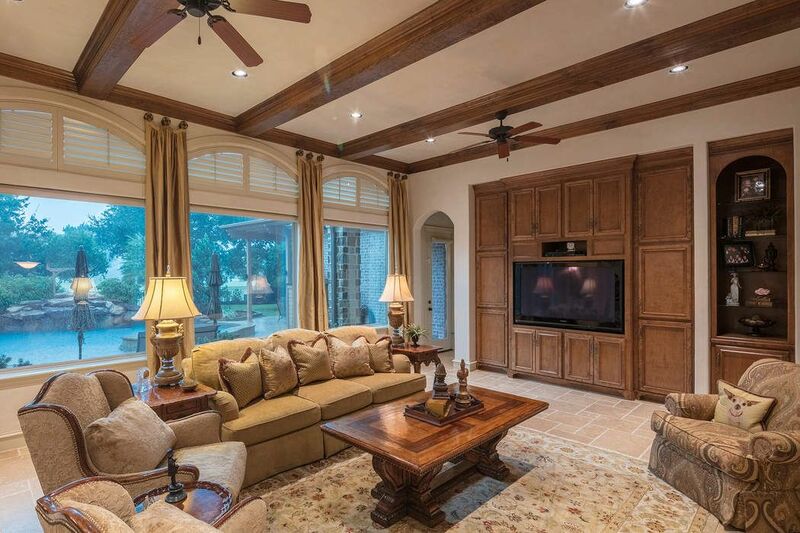 From the den, view the entry & reception gallery highlighting the seamless flow for entertaining. The double-sided fireplace services the family and dining room. Note the continuation of tile flooring and diamond plaster walls throughout. Gathering kitchen offers every amenity with its abundance of cabinetry, Thermador double ovens, warming drawer & side by side refrigerator. There is a built-in coffee center and separate icemaker. Walk-in pantry, laundry and mud room beyond. Kitchen viewing the den. 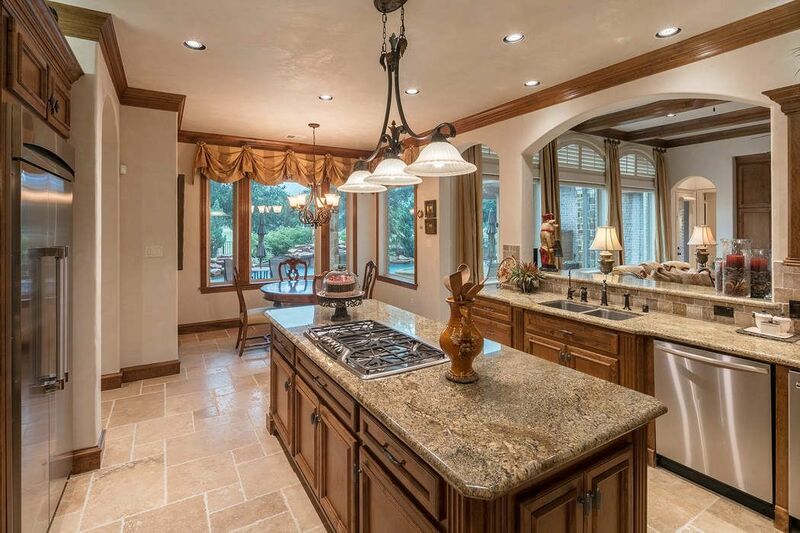 Note all of the lighting features this kitchen provides. 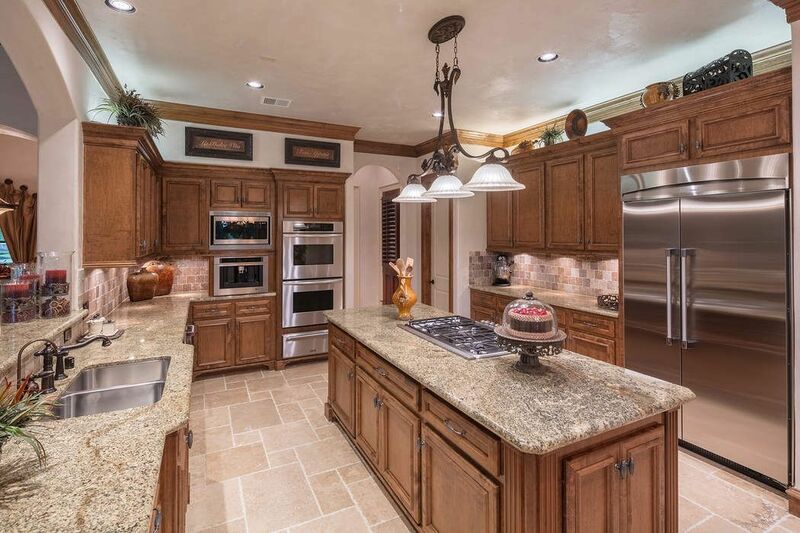 The chef can enjoy expansive views of your private retreat while preparing something delicious on the gas cooktop. Enjoy a relaxing moment with a cup of coffee. The epitome of sophisticated design for easy living and entertaining. 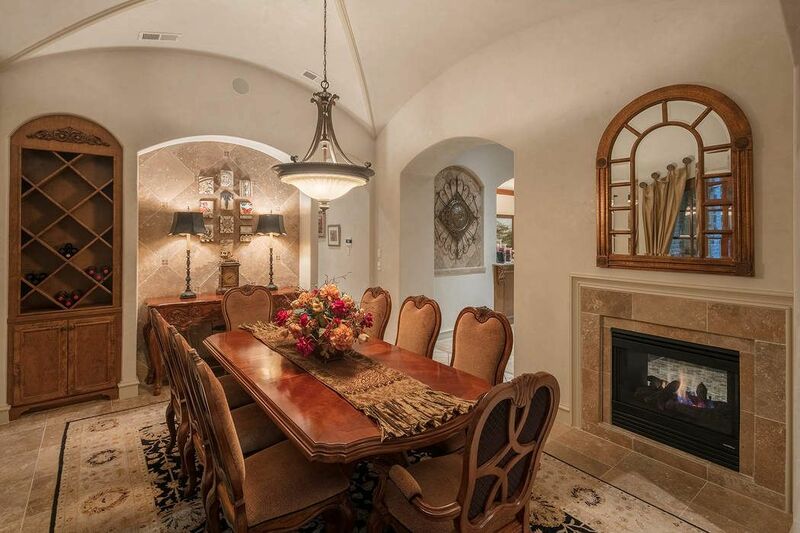 This spacious dining room boasts groin-vaulted ceiling with diamond plaster on all walls and ceilings. Built-in wine cabinet and an alcove for your buffet. 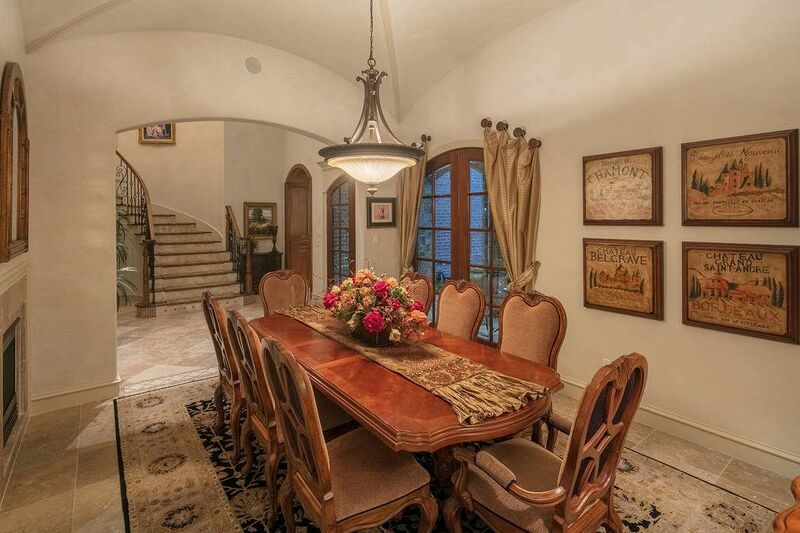 This home is defined by architectural details appreciated in this view. Note the grotto through the window by entry. 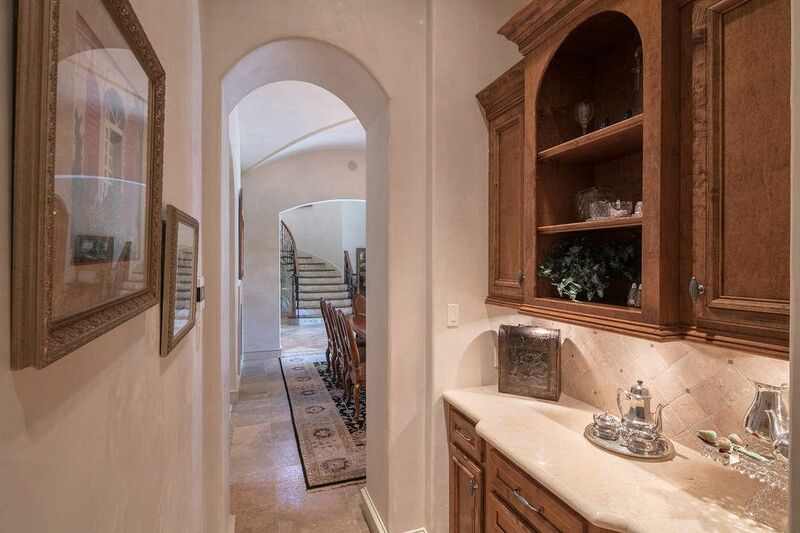 A wonderful butler s pantry located between kitchen and dining. Perfect to entertaining! 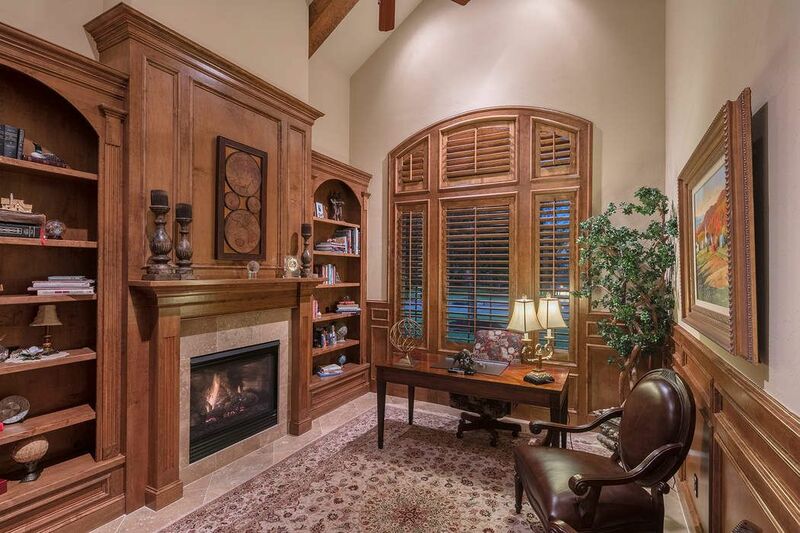 Architecturally significant study any homeowner would appreciate with beautiful millwork and custom details including the beamed, vaulted ceiling and welcoming, relaxing fireplace. This study has a separate computer 5 x5 room. 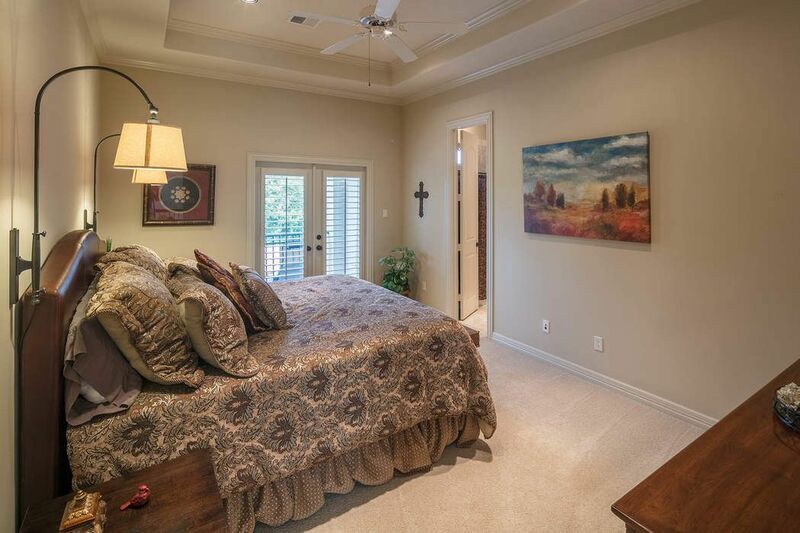 Downstairs master suite with private entry, double treyed ceiling, neutral decor, sitting area and beautiful views. There is a covered patio outside master to enjoy the a quiet moment. 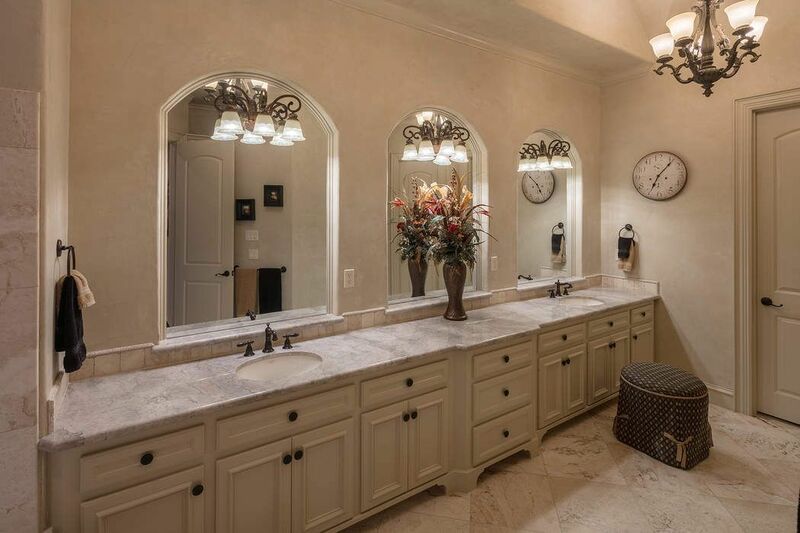 A spacious master bath to please every woman and man with an abundance of counter space and cabinetry. Tasteful and neutral decor. 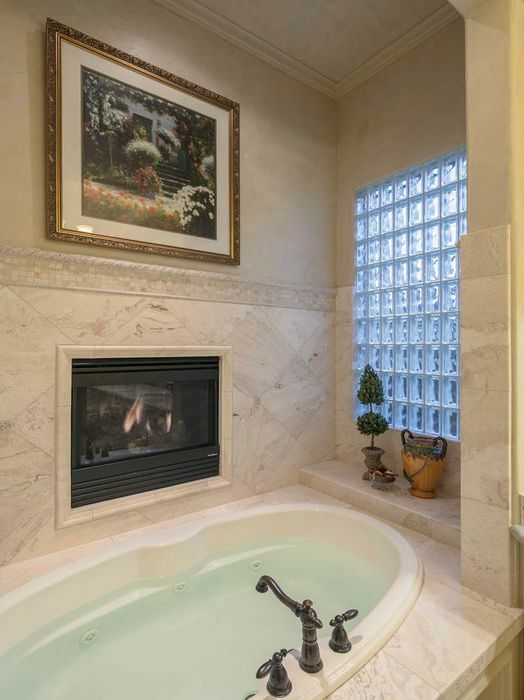 For a relaxing end of the day, enjoy your bath grotto with jetted tub and double-sided fireplace. 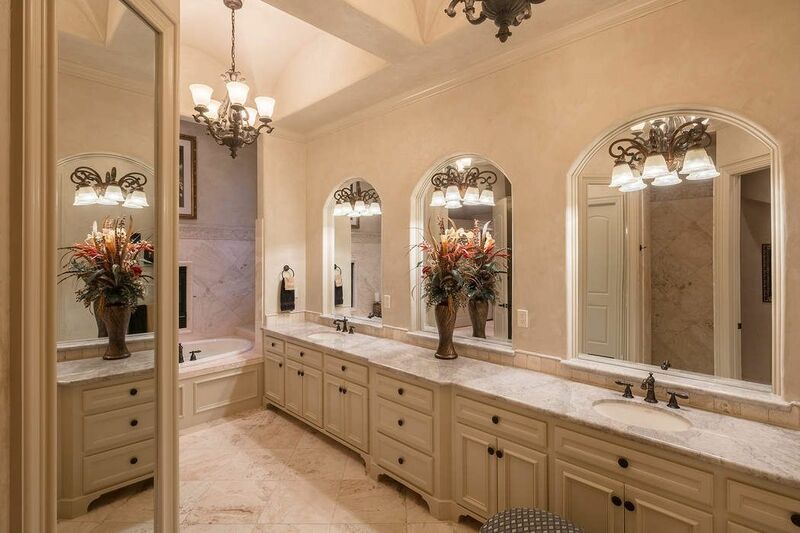 Another view of this lavish master bath. To the left of the floor to ceiling mirror is a walk-in shower. There are two separate walk-in closets. Separate downstairs guest suite with separate bath. Bath for guest bedroom downstairs also serves as a pool bath with tub and shower. 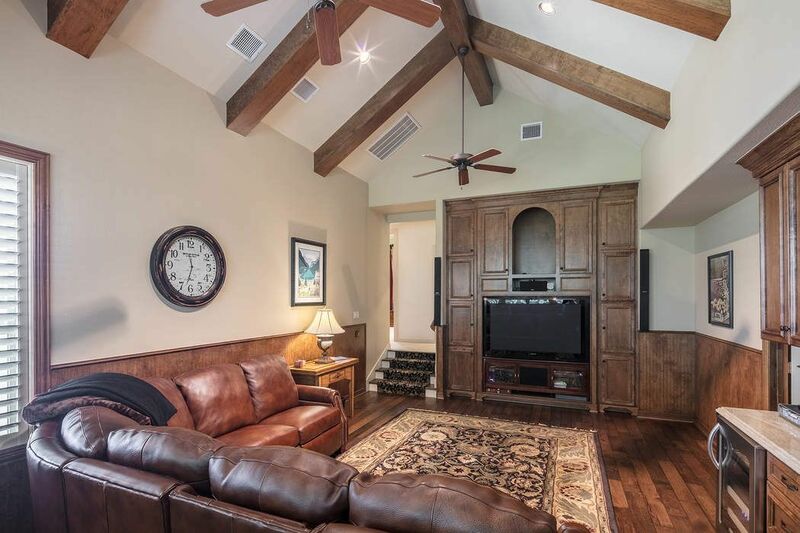 Upstairs gameroom provides wonderful living space that may serve as an additional entertainment area with built-in wetbar, built-in media cabinet, wood floors & vaulted-beamed ceiling. Behind sofa is an addition for extra seating or exercise area. Another view of this exceptional gameroom. To the right lies the media room and craft room beyond. 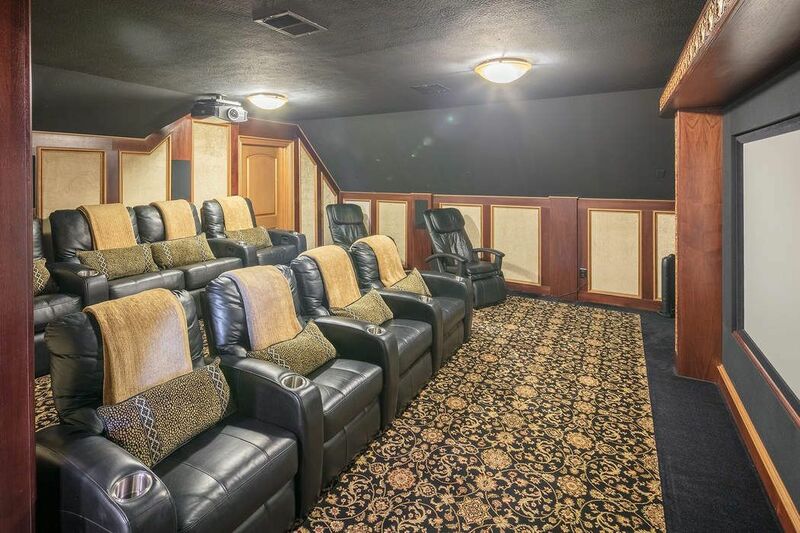 Fully equipped media room with large screen, comfortable seating for 10 and theatre lighting. 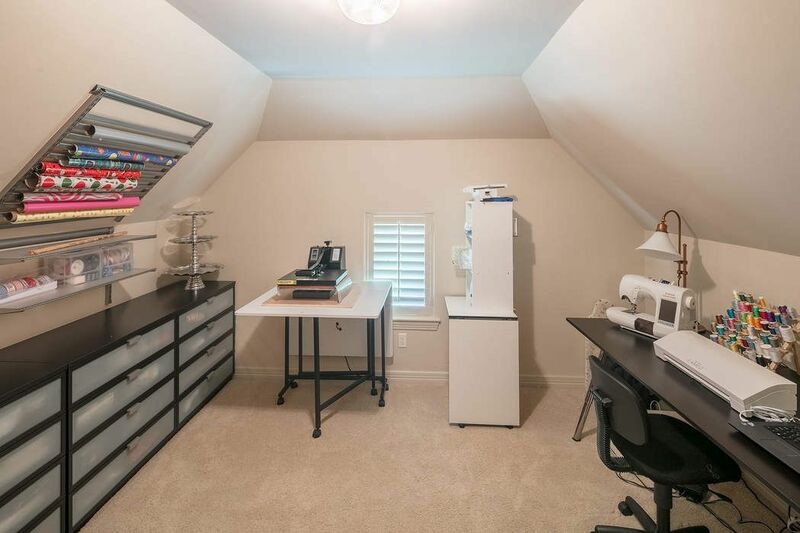 Don't miss the handy craft room behind the media room! Just too cute! 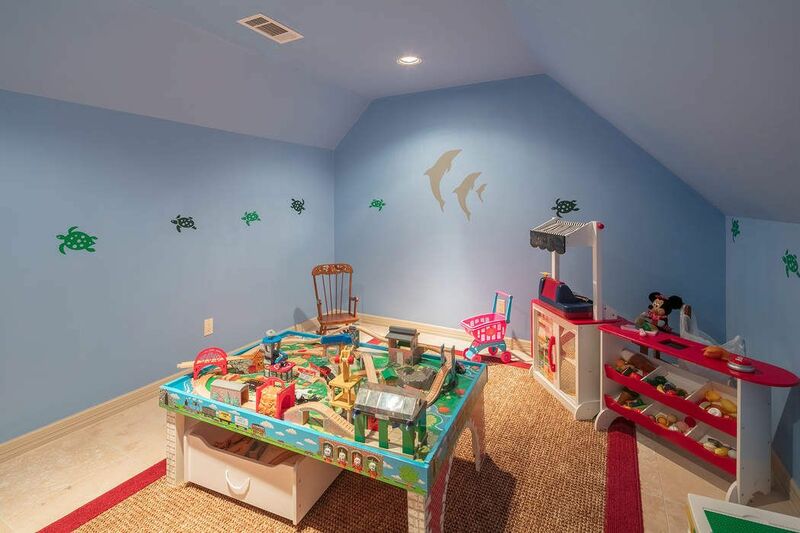 Here is such an adorable upstairs playroom. 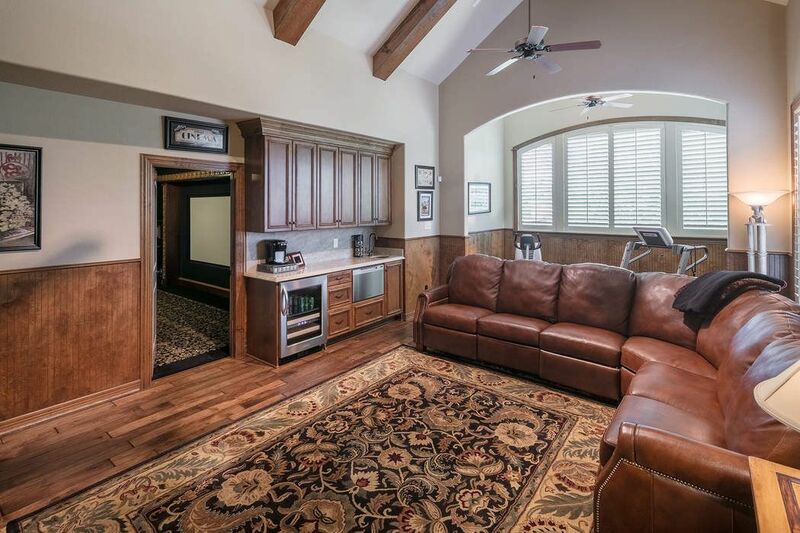 If an adorable playroom is unnecessary, this room would make the perfect Texas basement. Upstairs bedroom with private balcony and private bath. This bedroom measures about 16'x12'. 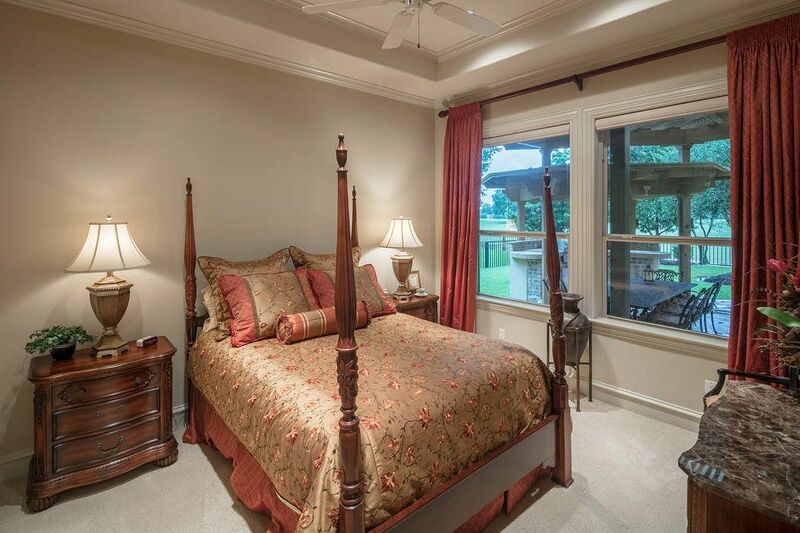 Another precious upstairs bedroom and private bath. 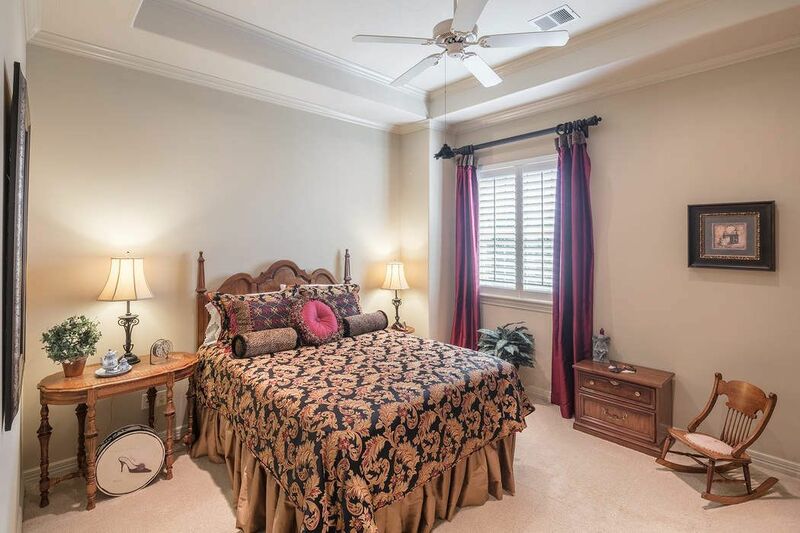 This upstairs bedroom is 13'x12' and has private bath. A beautiful pool with every amenity. 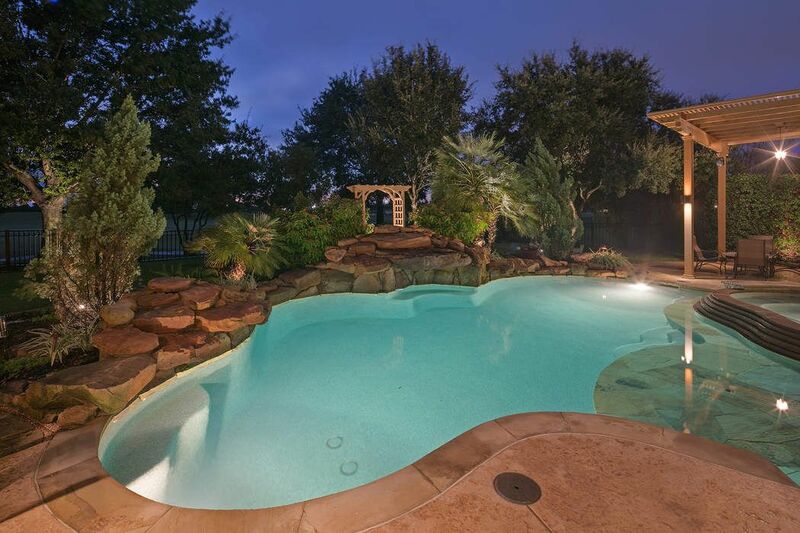 Grotto, sun deck, spa, rock waterfall and beautiful uplighting throughout this exceptional home. 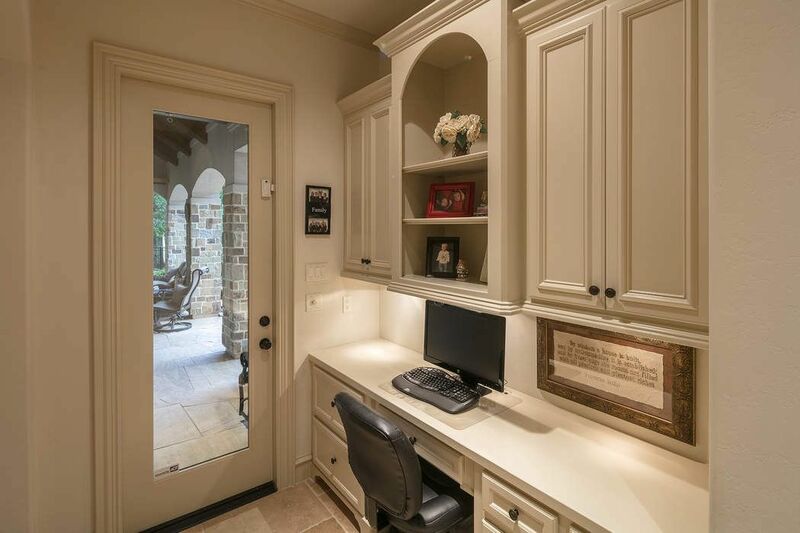 This home actually has three computer centers. This one is off the kitchen by back door. the second is a separate room in the study. The third is located upstairs centrally located in the hallway. There are two garages both are attached. The first is the two-car garage & the second is a one-car garage. 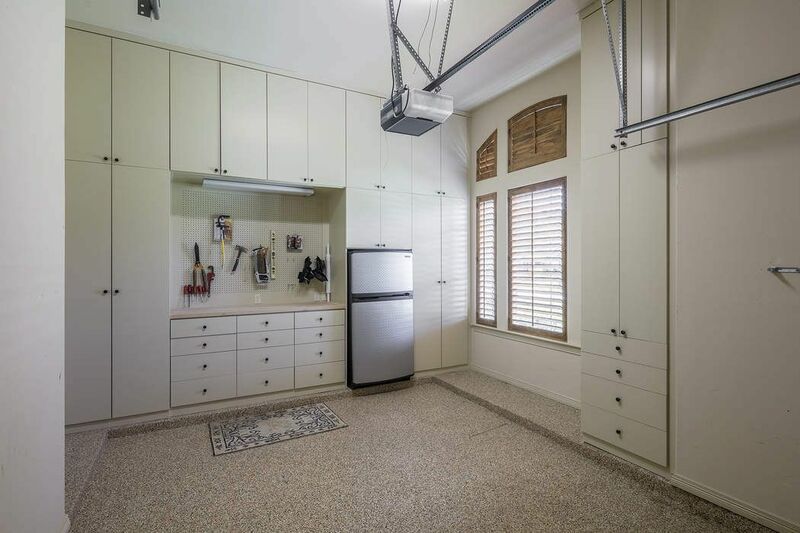 In the one-car garage the sellers added workshop cabinetry, work bench and refrigerator. Both garages have the epoxy-coated floors. 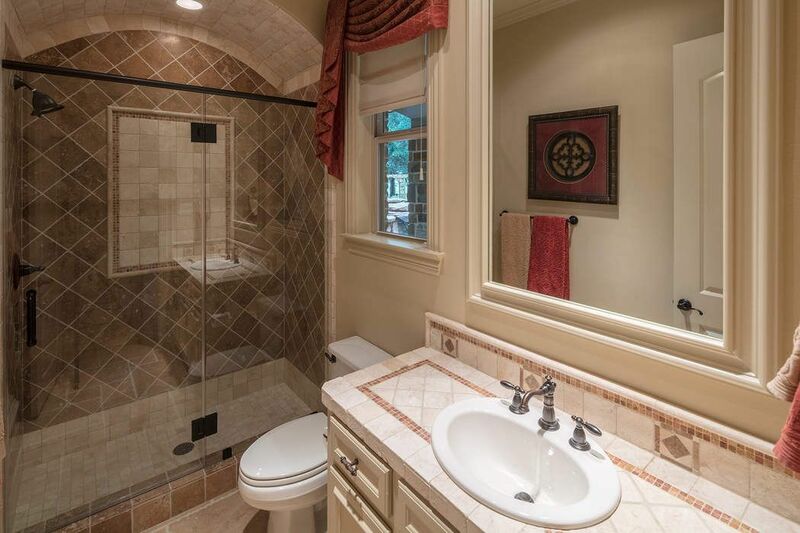 $899,900 5 Bedrooms5 Full / 1 Partial Baths5,476 sq. 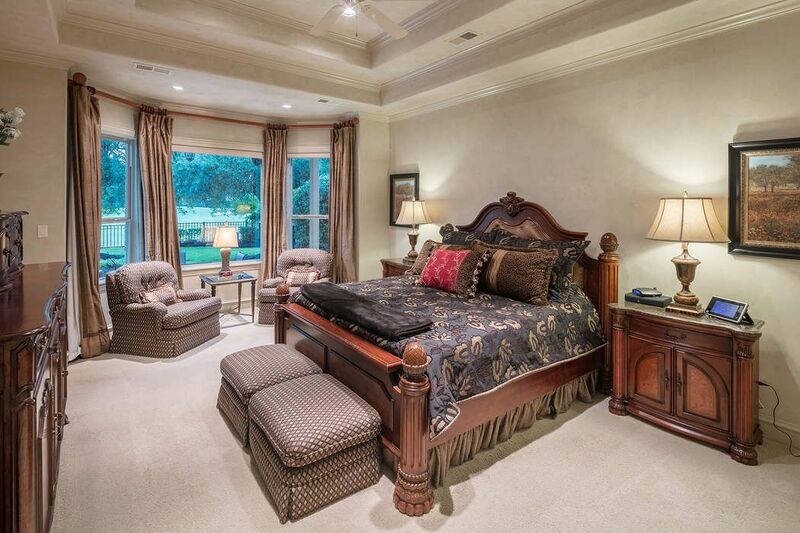 ft.
Resort-style living at its finest with expansive views of Black Horse Golf Club, situated on a spacious, approx. half-acre lot. Spacious rooms, diamond plaster walls in main living areas, a groin-vaulted ceiling in the dining room and an island kitchen. Master suite and guest suite down along with the impressive study and several computer stations. 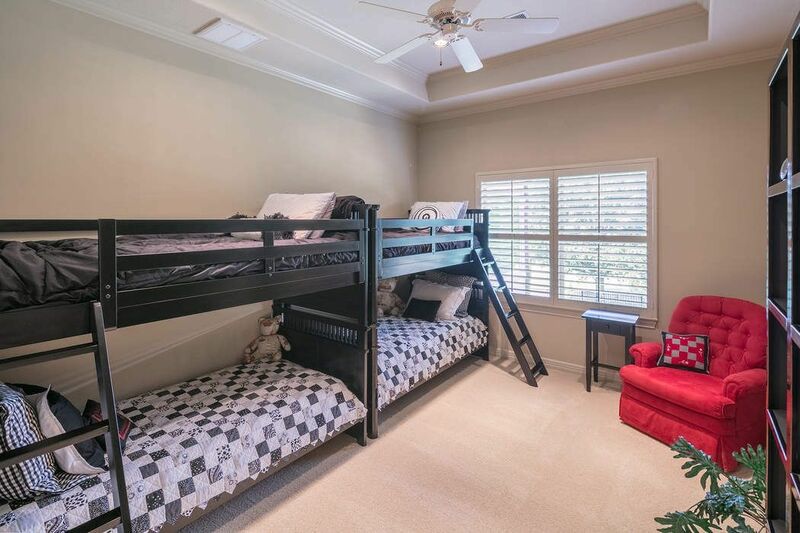 Upstairs provides a game room with built-in entertainment center and serving area. Beyond the game room is the media room and craft room. Three en-suite bedrooms are upstairs as well as a computer center. Stunning pool with waterfall, tanning shelf and spa. 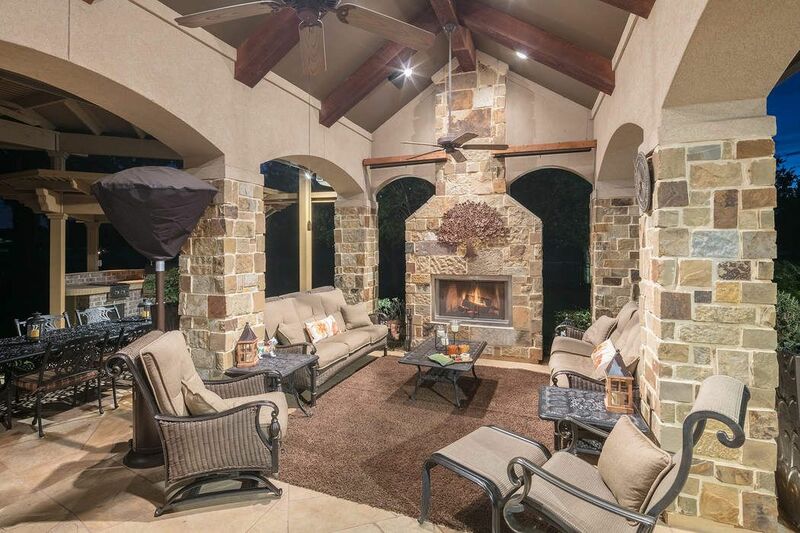 Covered outdoor living and dining space with summer kitchen and stone fireplace.